Maritime boundaries are critical elements to the planning of any activity in the ocean realm. From the early 1700s when the Dutch issued a decree establishing a "territorial sea" that was as wide as "the hypothetical range of an imaginary cannon," nations have sought to control portions of the global ocean which touch their shores. Under evolving criteria being established by the United Nations Convention on the Law of the Sea (UNCLOS), nations continue to redefine their sovereign claims to ocean space. Many industries and activities recognize the growing importance of maritime claim and boundary delimitation. National claims may overlap, creating areas of disputed ownership and jurisdiction that can lead to confrontation and even open conflict. In the assessment, exploration and recovery of petroleum, mineral or fishing resources, a distance of a few hundred meters can have significant economic importance. Trespassing a nation's claims could have serious consequences: arrests, fines, ship confiscation, prison, loss of limb or life. However, the reconstruction of maritime claims and boundaries and their associated jurisdictional aspects is complex, and in many cases, confusing or contradictory. Boundary agreements may take years to develop, often involving third-party mediation. The details and meaning of boundaries may be buried in pages and pages of text. 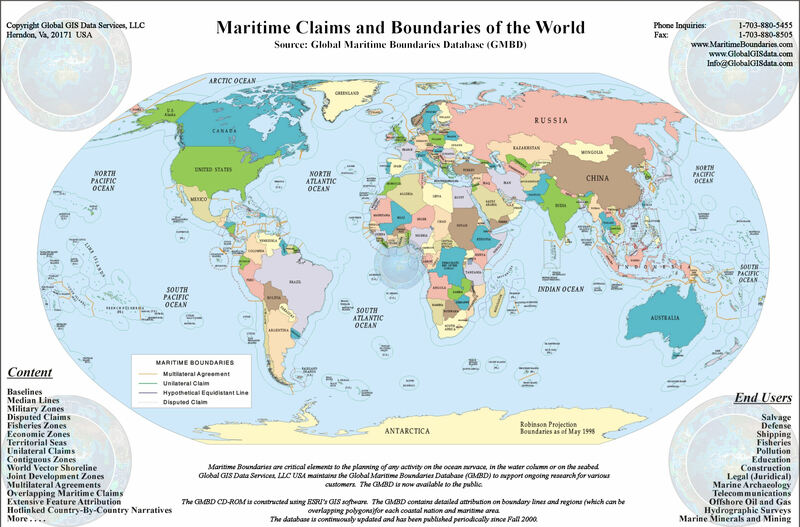 Until now, graphical portrayal of the claims or agreed boundaries has not been readily available to those involved in marine activities. Third party publishers of claims and boundaries data typically do not include graphics, portray only one boundary per graphic, or limit their graphics to only the agreed boundaries. The principal investigator started building and maintaining a global environmental GIS in the 1980s to address the research needs of consulting service clients. By client request, the commercial GMBD product has been available to the public since the fall of 2000. The Global Maritime Boundaries Database (GMBD) CD-ROM brings together the claims, limits and boundaries of the world with detailed attribution and documentation so they can be viewed, queried, and used in automated overlay analyses in GIS software. Included in the GMBD are: territorial seas; contiguous, joint development, fishing, and economic zones; potential claim median line solutions, disputed areas, boundary status; and much more. It will be your standard reference for quick access to vital, specific boundary information.